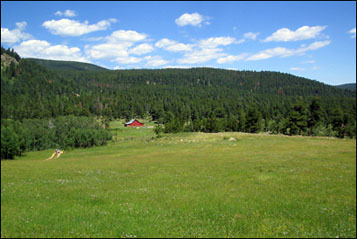 The sweeping, open meadow at Caribou Ranch Open Space Park. Caribou Ranch Open Space, just north of the funky town of Nederland off of Colo. 72, offers hikers a beautiful landscape highlighted by a large meadow surrounded by low, forested hills. The park’s DeLonde Trail, combined with the Blue Bird Loop and a short trail to the Blue Bird Mine, give the hiker a roughly 4.5-mile walk. Hikers and the occasional equestrian are all one is likely to see on the trail as dogs and mountain bikers are not permitted. From the parking lot, the single-track trail meanders through a pine and spruce forest with glimpses of the high peaks of the Continental Divide in the distance. The park’s elevation is between 8,300 and 10,000 feet and the elevation gain on the trails is minimal, making for very easy hiking. Even though it was mid-August when I ventured into the park, there were many wildflowers along the trail. After a short distance, the trail enters the edge of a large meadow, which serves as the center feature of the DeLonde Trail and Blue Bird Loop. Fences indicate that private property borders the park. How popular would such a rail line be today, from Denver to this meadow? A building at the Blue Bird Mine complex where silver was mined from the 1870s to the 1960s. The trail continues on the railbed, coming to a junction with a short trail to the DeLonde homestead. The Blue Bird Loop continues to the left, the route I took on this Sunday morning. A portion of this section is lined with aspens. A few steps down the trail, a tiny stream, DeLonde Creek, flows under the roadbed. The trail soon turns to double-track, inclining slightly uphill, then turning to sandy single-track as it re-enters the pine/spruce forest. The spur to the Bluebird Mine appears and the .1-mile trail leads to a collection of buildings and debris. Once at the mine, the sound of North Boulder Creek can be heard, still flowing strong in mid-August, perhaps from the snowfields high in the Indian Peaks Wilderness. Once at the Blue Bird Mine, interpretive signs explain that silver ore was mined here from the 1870s to the 1960s. 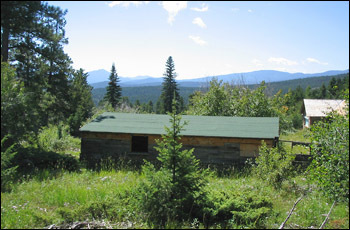 A miner’s bunk house, the entrance to a tunnel, a heap of mine tailings, and a brick-and-stone house built in 1941 comprise the small mining camp. The mine was named for blue azurite, a mineral often found in silver ore. While in operation, cars loaded with ore were moved from the tunnel down railroad tracks to the nearby Batesville mill. In 1882, 40 workers were employed at the site, producing 10 tons of ore daily, worth from $600 to $6,000 per ton. However, after more than 80 years, the “motherlode” was never found. An old dirt road leads from the camp up to a nice picnic area along the creek. The Blue Bird mine is an interesting spot to poke and kick around, hoping to uncover a silver stash. Some buildings, notably the old stone house, are being reconstructed. The restored barn at the DeLonde homestead. Returning to loop, the trail weaves through some pines with North Boulder Creek flowing on the left. After passing a large beaver pond, the trail leads to the DeLonde homestead site, with a large, restored barn and two-story home nearby. Continuing on the trail, the route cuts through the large grassy meadow at the center of the park, a quiet, sweeping expanse, leading to the end of the Blue Bird Loop. 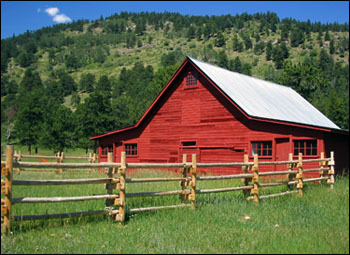 Caribou Ranch may ring a bell with 1970s music fans, as many recordings took place here in a music studio in a barn. Prominent among them was the Barnstorm album by the group of the same name. Walking through the park, the earnestness and simplicity of the record resonates through the meadow and trees.